Viewing topic "Controlling an XF8 from Cubase"
I’m using the supplied Cubase software with my XF8 for its notation features. I want to create a multi part score I can ultimately print. I’m using a printer type USB cable to communicate between the 2. Not sure what you mean in your second post. But, to get a Cubase AI midi track to play the XF, you will need a 5-pin DIN midi cable. I do not believe the XF8 can receive midi data via usb, only transmit. For receiving you need the 5-pin ports. When you have a midi cable, then connect one end to your midi interface/audio interface’s MIDI Out port. Connect the other end to the Motif’s MIDI In port. Select in Cubase the midi track you want to hear, and set the routing to your interface’s out port and whatever channel you have the Motif set to. That’s all there is to it. Just doesn’t work with USB. Ok thanks, that would explain why everything works in one direction at the mo. I thought usb is the preferred connection method. I do have the correct midi cable so will try when I’m next home. The USB “TO HOST” port, in conjunction with the proper USB MIDI Driver and correct port assignment in applications, supports MIDI communication in both directions. In fact, the USB connection provides the equivalent of multiple bi-directional MIDI ports. While Port 3 provides a MIDI Thru port for external devices, via the 5-pin connectors, such a connection isn’t a necessity. 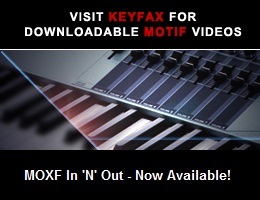 See MIDI channels and MIDI ports on page 57 of the XF Owner’s Manual. Note that in addition to what’s described there, Port 4 is used for the Yamaha Editor. Thanks 5pinDIN that’s v useful info. Will try this also next.